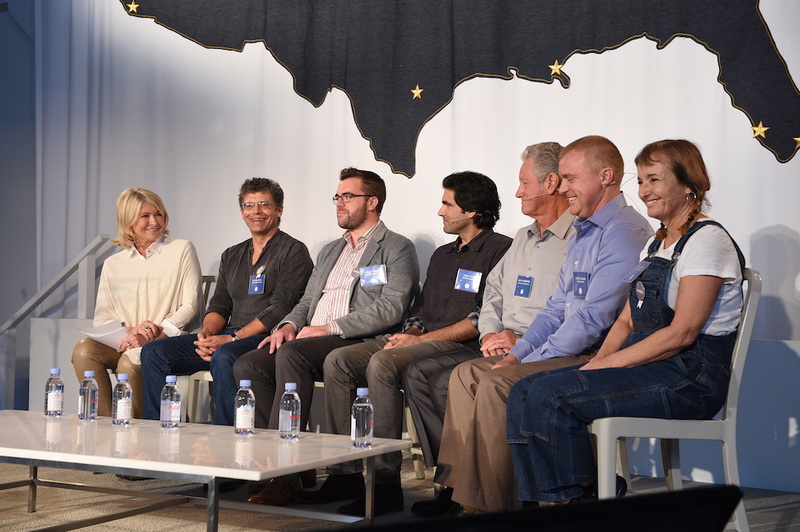 For its fourth year, Martha Stewart Living Omnimedia has hosted a summit to celebrate “American Made” ventures, highlighting start-ups alongside multi-generational family-run businesses. In opening comments, Martha Stewart noted that core themes of craftsmanship, creativity and innovation were the hallmarks of the 40+ “American Made” honorees over the last four years. In addition to recognizing this year’s eleven “American Made” honorees—which range from Baiser Beauty (a line of natural, hand-crafted beauty products) to Gotham Greens (a company converting unused city rooftops into greenhouses growing produce)—the Summit also drew attention to some innovative work going on across the country to restore “American Made.” In Detroit, Ponyride is a non-profit that has set up a quasi-incubator/accelerator that enables socially-conscious entrepreneurs and the businesses to share space, with a mission of helping rebuild Detroit. The large, remodelled spaced enables businesses to co-locate their management teams and production teams. One company, the Empowerment Plan is transforming winter coats into sleeping bags for the homeless, and training current and recently homeless residents to do the labor. Currently, there are a dozen businesses in residence at Ponyride’s unique facility. In a similar manner, Manufacture NY is setting out to rebuild a portion of NY’s fashion industry, which has lost significant manufacturing jobs in the past 20 years. Bob Bland, the CEO & Founder, described the business model and its physical offices as effectively a mix of a fashion incubator, product development house, R&D lab, manufacturing and ecommerce launchpad. Co-location of these diverse teams enables collaboration and improves the ability to get product to market quickly. Daniel Silverstein, a finalist on the reality show Fashion Star, is one the designers already building his line through Manufacture NY. The business is supported by a public—private partnership which helped secure a $3.5 million grant, enabling a pilot in the Garment District and expansion into a 100,000+ square foot facility is opening in Sunset Park, Brooklyn. The Summit also included panels on financing, marketing and social media. On a “Financing Your Dreams” panel moderated by Fran Hauser from Rothenburg Ventures, Hauser noted that “financing can be one of the most important and difficult issues” for entrepreneurs. Her guidance to entrepreneurs starting out was to look at the business horizon over the next 18 months and to determine what revenues the business would generate and what expenses would look like to frame the capital that needed to be raised. With this 18 month timeframe, Hauser said, enables the business owner to realistically have a solid 12 months to focus on operations while recognizing that the initial capital raising is likely a 6 month process. For capital, the panel talked a range of sources that business owners can tap into, starting with self-funding and friends and family, and moving into tools like kickstarter and outside funding in the form of angel investors and venture capital. Interestingly, a common theme across these efforts was the importance of storytelling. Mike Del Ponte from Soma Water noted that Kickstarter was successful for their business early on, helping raise over $100,000 in under 10 days, because they had a compelling story for the end customer that they were directly appealing to for funding. Suzanne Xie, a serial entrepreneur, noted the importance of heavily researching potential investors in her capital raising, which has netted $4.4 million. Such research, Xie noted, was pivotal in getting her foot in the door with investors, but she acknowledges that was only half the battle. She then needed to focus on building the story about Hullabulu’s product and how they would market to gain support from angels and VCs. Interestingly, Hauser noted that as an angel, you’re often investing in the founder and the market – there may not even be a product yet; so the story and the story-teller can be key. Taken together, a common underlying theme from a number of the panelists was that it was important not to just be skilled in the “craft” of their business, but in crafting and fine-tuning their business model, and crafting and shaping the “story” of their business for both consumers and investors.